For years, the subject of menopause has been aimed solely at menopausal women. However, as society has developed we've realized that partners and family members should also learn about the transition and its effects. Menopause is one of the most bothersome periods of a woman's natural life, but by understanding her suffering, you can help support both your relationship and her experience. The menopause symptoms are caused by her reproductive system slowing down and hormonal imbalances occurring more frequently. Mood swings, and other menopause symptoms that can seem difficult to contend with, are the natural consequence of a decreased production of reproductive hormones. Once you have accepted your partner is experiencing symptoms beyond her control, you'll be able to understand why she's happy one moment and angry the next. Sometimes, your partner might just need some time away from the commotion of hectic everyday life. Try to be understanding and learn to recognize when taking the kids out for a walk would be most appreciated. It might take some minor adjustments, but you will learn to recognize when she needs space. Mood swings can put a strain on both your relationship and your partner's mental well-being. If you feel like you're taking the rap for more than you deserve remember, your partner is experiencing natural but uncomfortable symptoms beyond her control. Try to stay positive and offer your continual support. Actions not words truly demonstrates someone's love for another. Try to reassure your wife of your continued affection by taking the time to listen to her concerns and making considerate gestures. Suggest that you both make healthy lifestyle changes in order to become healthier, and ultimately, happier. Try exercising together, preparing meals that are nutritious, and sleeping for the recommended seven to eight hours to improve your well-being and moods. By making these changes together you'll be able to motivate one and other. Mood swings become more common during menopause because they are triggered by hormonal imbalances. While this symptom can have a significant impact on your partner's moods and yours by relation, there are ways of managing the situation. 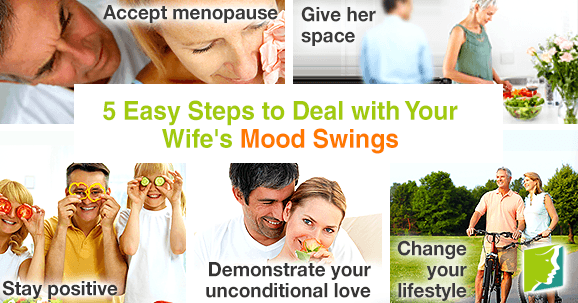 Click on the following link for more information about different mood swing treatments. The Health Center. "Adult Mood Swings".(n.d). Retrieved from www.thehealthcenter.info. The extra hormones introduced to the body by birth control can affect your mood swings.